Minimalist Japanese retailer MUJI has opened its largest store outside of Asia on Vancouver’s Robson Street. 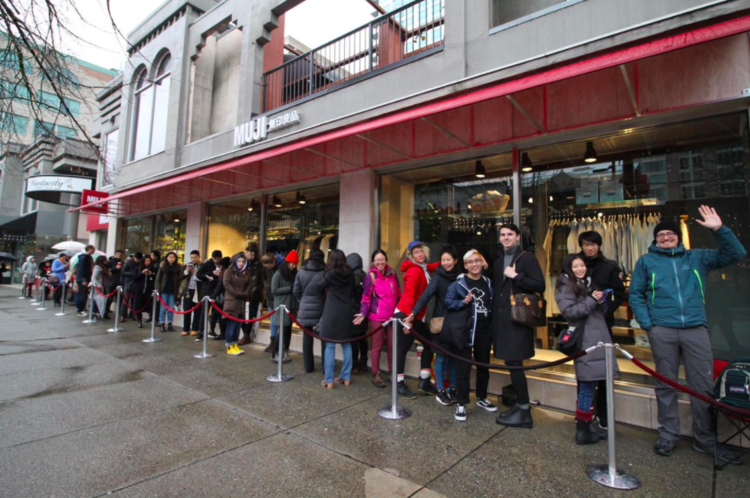 Thousands lined up for the store’s opening on Saturday, and the lineups are expected to continue well into 2018. The 14,507 square foot store is unlike any MUJI location in North America, offering a host of products and services not available at its other Canadian locations. MUJI says that the store has more than 4,500 products including household goods, apparel and food, in a remarkable retail space that includes a massive skylight above part of the store. MUJI opened its first store in British Columbia in August of 2017 at Metropolis at Metrotown and at the time, it was the largest in Canada at 7,770 square feet. Both the Metrotown and Robson Street lease deals were coordinated/negotiated by Martin Moriarty and Mario Negris of CBRE Vancouver, as well as Arlin Markowitz from CBRE Toronto.